I love a classic white shirt. It looks so clean, so crisp and so effortlessly elegant. Know what I mean? 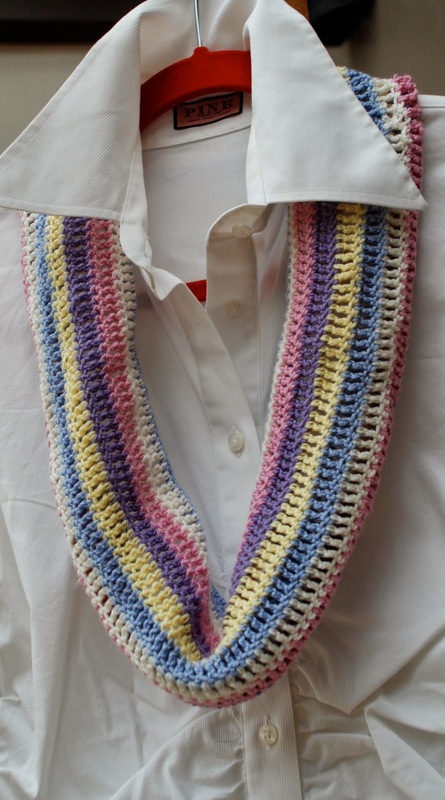 And this morning I'm busy dressing up my white shirts with a new made-for-spring scarf/ cowl. It's pretty versatile really, and super easy to make. 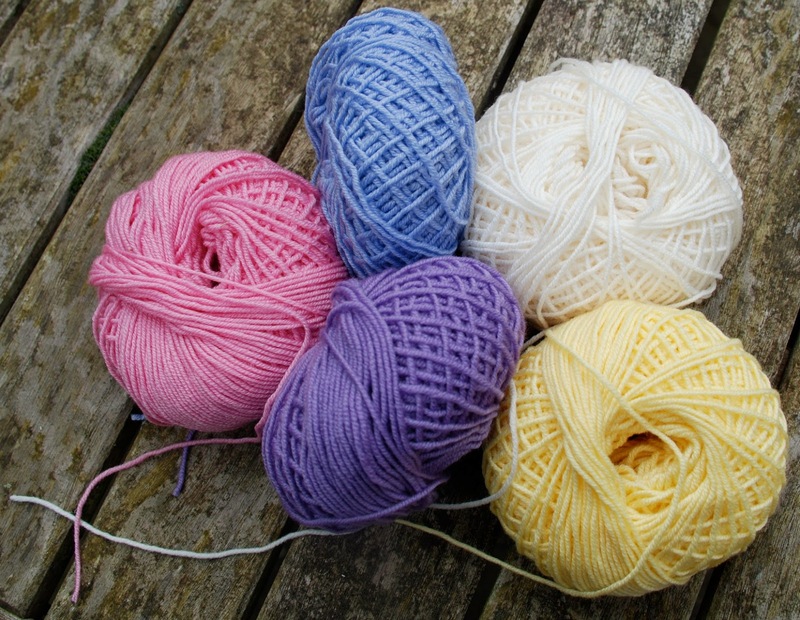 I used about 60 yards of each colour of some left-over wool that I had from another project. Here are my raw materials. The pink, blue, ivory and yellow are Sublime baby cashermere merino silk in 4 ply and the purple is Sublime extra fine merino in 4 ply. 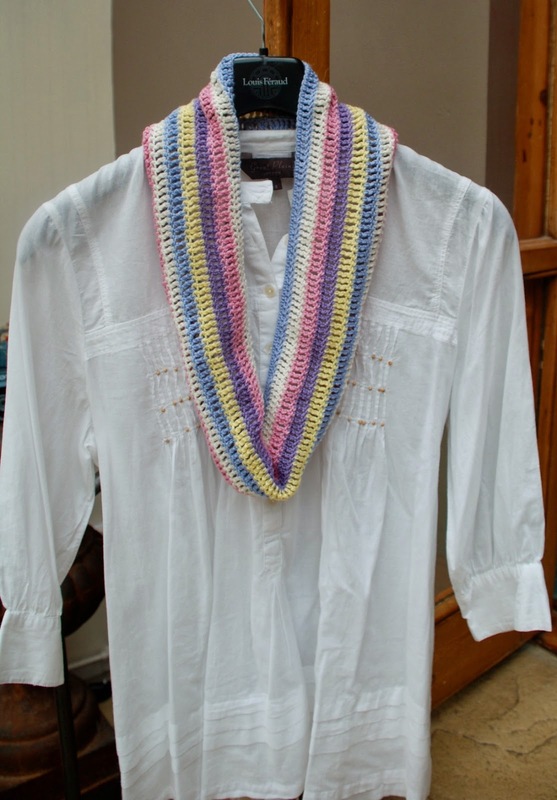 They crochet into a lovely, light-weight scarf that's perfect for spring. Cast on and chain 150 stitches. Join with a slip knot to the first stitch in the chain to make a closed circle. For the first row: chain 4. Work a double treble (English) or a treble (US) into the next stitch to the slip stitch and into each succeeding stitch until you work your way right around the circle to the chain 4 at the beginning. 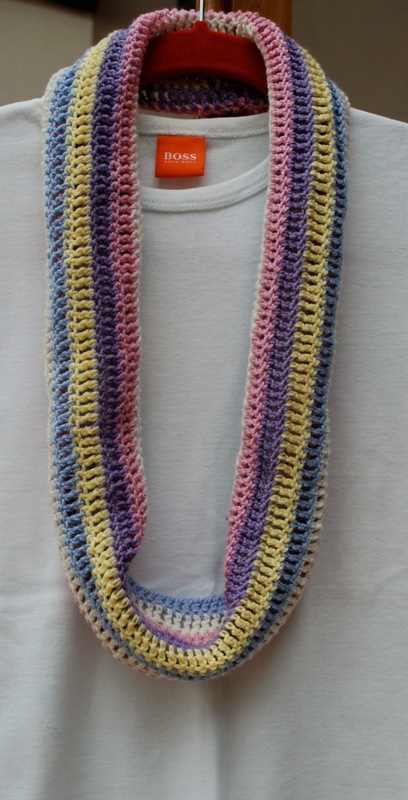 Join with a slip stitch to the 4th chain of the original chain 4. Cast off. Cast on with a slip stitch in the next colour and repeat row 3. 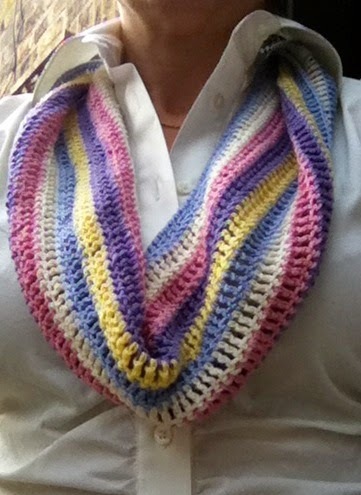 Carry on, changing colours as you complete each round until your cowl is as wide as you'd like it to be. I worked mine for 11 rows, so that it had the blue that I'd started with at each edge. Darn in your ends and - ta-dah!- you're done. It really is the easiest thing to make.